Frederick, MD - On Wednesday, October 30, 2013 the Tourism Council of Frederick County (TCFC) honored Don Freitag as the Tourism Ambassador of the Year during its Annual Membership Breakfast. The Tourism Ambassador of the Year award can be presented to anyone in the community, whether in the tourism industry or not, who helps to improve the experience of visitors to Frederick County, thus helping the TCFC to achieve its mission. Don Freitag serves as a security guard outside of Colonial Jewelers in Downtown Frederick. After the unfortunate robbery of Colonial Jewelers earlier this year, owners of the store hired full time security to provide peace of mind and safety for their employees and customers. Stationed out front, Freitag is frequently asked directions, restaurant recommendations, and a variety of questions from visitors and locals alike. 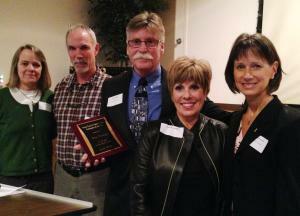 Gerry and Clyde Hicks, owners of The Trail House in Downtown Frederick, nominated Freitag for the award. “He has become Frederick’s own human kiosk!” they said in the nomination statement. “He is quick with a smile, a wave, a genuine hello, and everything else that you would expect from an ambassador,” they added. “Sometimes good things do come from bad times, and Don is certainly a clear example of that,” said Clyde Hicks during the award announcement. Tourism’s Annual Membership Breakfast was held at the National Shrine of St. Elizabeth Ann Seton with approximately 100 industry members and partners in attendance. To learn more about the Tourism Council of Frederick County, visit www.visitfrederick.org.